Some of my favourite breakfasts are actually smoothies. They are not only delicious and thirst quenching, but they can be packed full of nutrients. 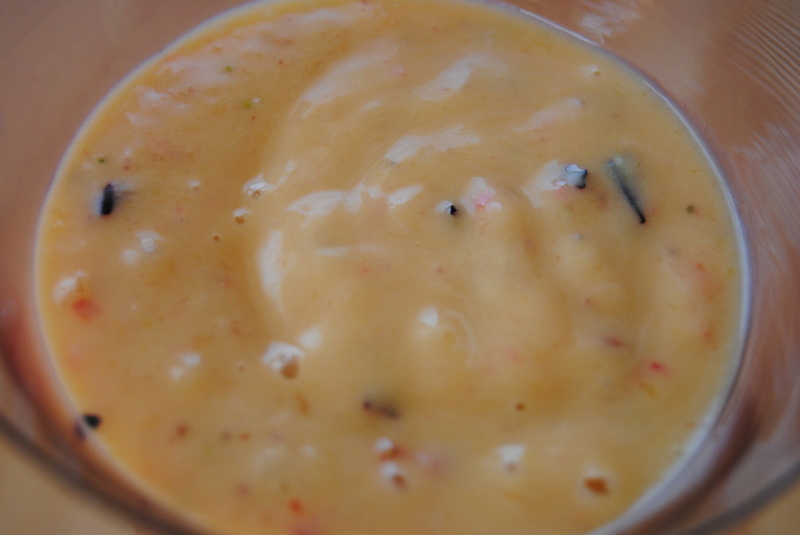 If you want to have a creamier smoothie, add some banana to it. This is a good way to make it dairy free and add even more nutrients. Don’t worry about making a specific recipe, just add in whatever you feel like. Some good ideas are blueberries, peaches, mangoes, strawberries, bananas, raspberries, oranges, papaya and blackberries. You can also add nuts and seeds to give it a protein boost. Fruit passes through the digestive system relatively fast, compared to other foods. Since your digestive system can sometimes be sluggish in the morning, it’s a good idea to provide it with foods that are easy to digest. If you bombard your body with a really heavy meal first thing, it will use up a lot of digestive enzymes just to break it down. This can leave you feeling tired later and your body has to work overtime for the remainder of the day. Ground flaxseeds are also a great option for smoothies. They contain omega 3’s, the essential fatty acids that our body doesn’t make, and they also have a high fibre content. 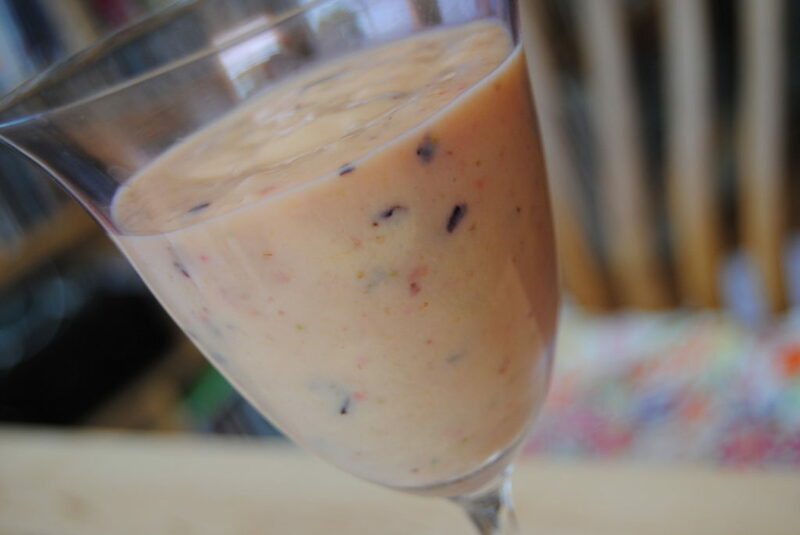 This particular smoothie contains banana, mango, blueberries, raspberries, cashews, coconut oil and ground flaxseeds. I often add a little water if I want it to blend easier. If you drink juice each morning, try to replace it with a smoothie instead. Juices are usually concentrated and very acidic for the body. Their fibre has been removed and they spike our blood sugar which can lead to hypoglycemia and diabetes. This is also a great beverage to drink if you’re on a detox. 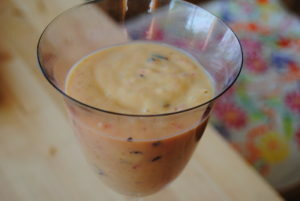 Overall, smoothies are an excellent way to improve your digestive system, gain more nutrients and feel more energized. Have one today!